Florence Amerigo Vespucci Airport (FLR) offers travellers to Florence, Italy a good selection of ground transportation and travel options to suit every passengers' needs in Italy. Serving Florence, Tuscany and the surrounding area of Italy, ground travel and transport facilities at Amerigo Vespucci include regular buses and taxi services. A Sita / ATAF bus service (Fly by Bus) connects Amerigo Vespucci Airport (FLR) with the central Santa Maria Novella railway station, in the heart of Florence. Many regular buses travel to and from the airport throughout the day, departing from outside the principal terminal buildings and using both city bus lines and interurban routes. The journey into central Florence by bus lasts around 20 minutes and is the most inexpensive way to travel into the city. Ticket machines provide a convenient way to purchase tickets for these buses. 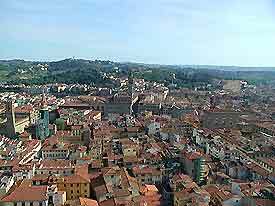 Taxis are readily available and ara easy to come by, being situated directly outside of the main arrivals gateway, where they provide a fast and relatively inexpensive way to travel from FLR Airport into Florence. This particular journey will take around 15 minutes, depending on traffic. Worth noting, only authorised taxis should be used, to ensure safety and the prevent possible overcharging. The taxi meters start at a basic fare, but additional charges may be added for luggage, late-night driving and travel on public holidays in Florence, so it can be work checking with the taxi driver about these before departing from Amerigo Vespucci Airport (FLR). Some cabs are now happy to accept credit cards.